Enclosure Oasis – Small™ cleverly combines two models of spa enclosure – SPA Sunhouse® and SPA Veranda. The biggest advantage is the construction which leans to an existing wall and this way creates covered space for your spa, swimming pool or even winter garden. In this newly created space you can fully relax in the comfort of your own garden. 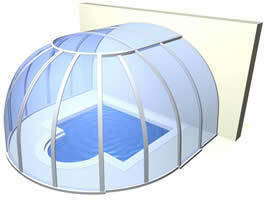 The enclosure has half-dome which is possible to open widely plus roof door for even better ventilation. Our bronzed polycarbonate version protects you against sun rays and naturally regulates inner temperature.